The leather used in these bands come from Italy or Argentina and is tanned using the vegetable method, which involves using the tannins from tree bark and leaves. I received the natural yellow color for review, but it is also available in navy, coffee, and amaranthine (a deep reddish shade). The yellow shade turns to brown over time as it develops a natural patina. 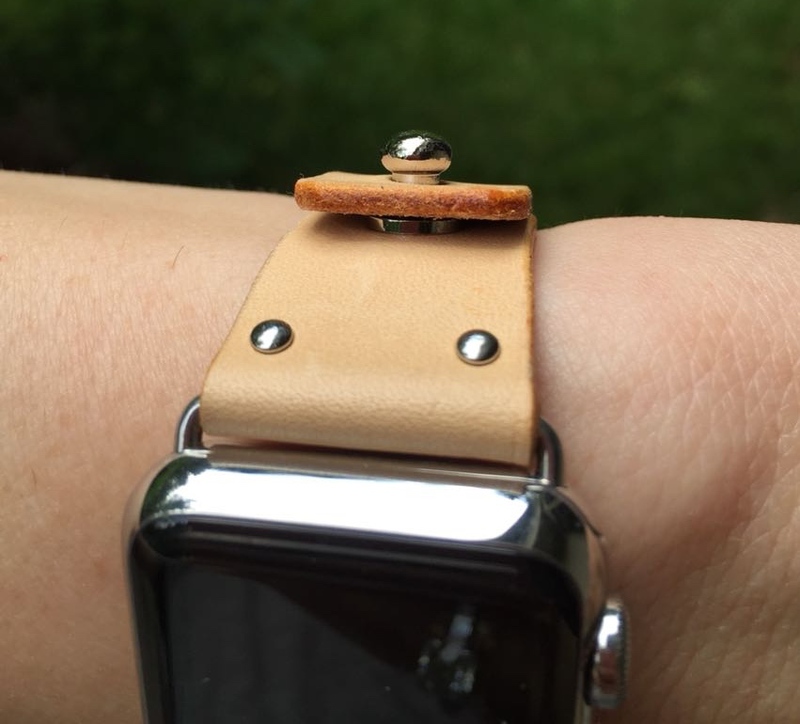 The seller treats the leather bands with neatsfoot oil or mink oil before sending. You can use these oils at home to polish the band and to speed up the patina development, but it’s not at all necessary to do so. 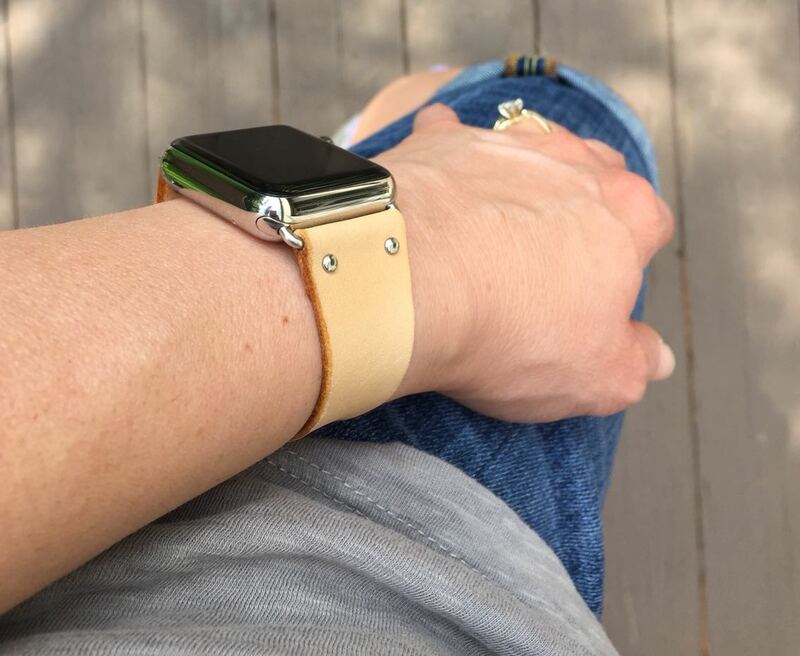 The leather strap comes with the adapters included; choose from shiny silver to go with the stainless steel of the Apple Watch, frosted silver for Apple Watch Sport, or frosted black for Apple Watch Sport in Space Gray. You also get a 0.8mm S2 steel screw driver in case you want to swap out the band for a different one and a 2.5mm punch tool so that you can adjust the stud position if necessary. Two additional studs in gold and dark gray are also included. I have to say, I love this band. It is utterly unique and will not be mistaken for any of Apple’s offerings. The clasp is a large stud rather than a buckle or loop. The band attaches to the adapter with two tiny flat silver studs and sits almost flush. It doesn’t have the large gap between strap and adapter that many cheap third-party Apple Watch bands do. It feels expensive and luxurious to the touch. The leather is thick and supple right out of the package. There is no stitching; just two precision cut leather strips. The adapters took a bit of finessing to attach to the watch, but once on, the fit was correct, snug and secure. 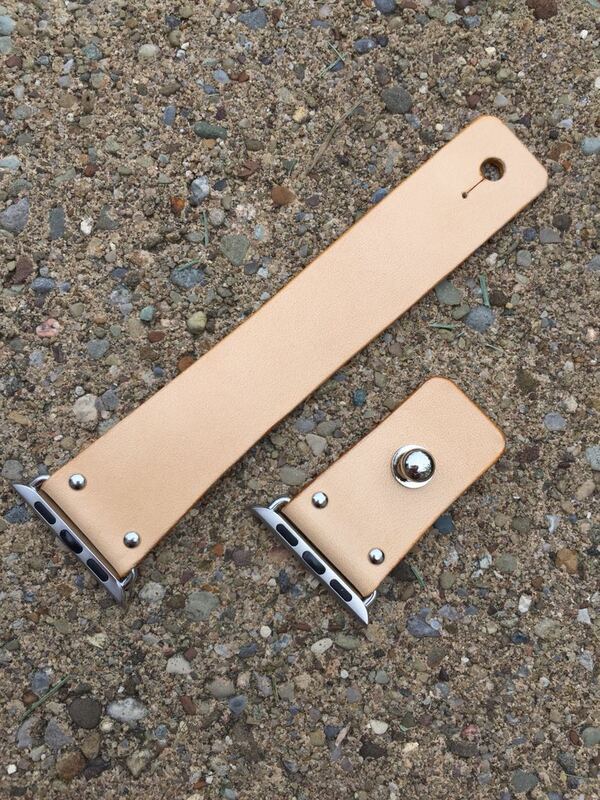 The seller attached the stud for me based on my wrist measurement. It was a little bit tight when it arrived, but as I wore it and manipulated the leather, it loosened up to a perfect fit. It’s just as comfortable as my fluoroelastomer Sport band. I’m enjoying the color as it is, but I look forward to seeing it develop its patina in the months to come. 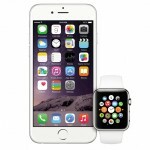 Pricewise, it is closer to Apple’s Sport bands than its leather offerings. Yet it offers the upscale style of leather and comfort of fluoroelastomer with a style all its own. Leathersy offers four Apple Watch band colors in 38mm or 42mm sizes for $85 each: yellow, navy, coffee, and amaranthine. If you’re interested in other third-party bands, be sure to check out my band round up.